Here is a continuation of Grace Hunter’s memoirs, which i first posted on September 5, 2011–click on this link to read the introduction. Grace, daughter of George Walker Hunter and Ida Ellingwood Hunter, was born in 1895, so would’ve begun school around 1900 or 1901. At the end of that first post, she had just been writing about starting classes at the old Petrolia School, located near the site of the recent (and soon to be again) Yellow Rose Restaurant. In each classroom was seated about 60 pupils. The teachers were very efficient and helpful, but very strict when it came to behavior—they each had a large whip they were forced to crack at times, but I’ve never known them to have to use it because the parents in those days knew the teachers to be fair and they cooperated. The exams at the end of the year came sealed from the Superintendent’s Office in Eureka, so we had to be thorough in all lessons or else it wouldn’t only look bad for the child but for the teacher as well. If a pupil needed help, it was generally demonstrated on the blackboard which ran the length of the room behind the teacher’s desk, either by a pupil or the teacher. I remember three of the older girls had taken a large shoe box and made a doll house with cardboard and colored tissue paper. We could each have a look inside for one straight pin or three looks for a safety pin. There were children from the following families in attendance: The George, Elias, and Johnny Hunters; Lucian and Marshall Wrights; William Clarks; Charles Johnstons; Jacob Dudleys; Fayette Titus’s; Martin and Albert Boots; Patrick O’Learys; Weaver Denmans; Charles Goffs; William Rudolphs; Fidel Guglielmini’s; William Belloni’s; ____ Saunders; Henry Duffs; James Harts; Frank Gouthiers; Levant Cooks and nephew and niece—the Fruits—who made their home with the Cooks. The families were large, mostly ranging from 8 to 12 children. What a wonderful time they all had to gather on Fourth of July picnics, dances, parties, and midnight suppers in the Petrolia Knights of Pythian Hall. Mothers stayed up to finish making pretty tucked and ruffled dresses the evening before these occasions sometimes until two o’clock a.m. Dress goods at that time ranged from 10 cents to 25 cents per yard, stockings from 5 cents to 15 cents per pair depending on the size, shoes from 25 cents to $1.50. Dress shoes, if you could afford them, were slightly more, hats were from 15 cents to 50 cents. Children’s underwear for most families were home-made from bleached flour and sugar sacks as were some curtains and pillowcases. Most of the furniture was homemade—the chair seats laced with rawhide strips that our fathers had tanned from hides. The mattresses were made of strong ticking and filled each year with fresh straw and laid on hand-split boards. Feathers were always saved for pillows. Long benches were placed on each side of a long table with a chair at each end. The women’s blouses had long sleeves and high collars and were worn inside the skirt band—the long flared skirts stirred dust on the bare floors as the women walked. Petticoats were heavily ruffled at the bottom—their shoes were high-laced. Because of the food my father George Hunter raised and the wild game and fish, it cost but $100 per year for flour, sugar, kerosene, coffee, and a few other necessities. Meat and fish they smoked, dried, salted, and canned. Two-quart jars with old-fashioned lids and rubber rings held the winter supply of food including jelly, jam, preserves, and fruit butters. The Mattole Valley was beautiful in those days with the large painted farm houses with locust trees, moss and tea roses—including many old-fashioned shrubs and climbing vines. The heavenly aromas that came from the kitchens tickled the noses of anyone who chanced to be around. And the large orchards were beautiful and enchanting as we watched the blossoms and the baby birds in their nests among the branches—with their mouths wide open waiting for a worm from their mother. The songs of the many different birds were enchanting especially the meadow larks with their loud distinctive warble. The barn was large and boasted a blacksmith shop at one end where us kids at times would work the billows to liven up the fire for our Dad so it would soften the metal he wished to hammer out and shape. The barn was our playground during winter weather—the rest of the year, we did what was needed to be done whether it was pulling mustard from the large oat field, picking wild berries, or cutting and stacking wood. 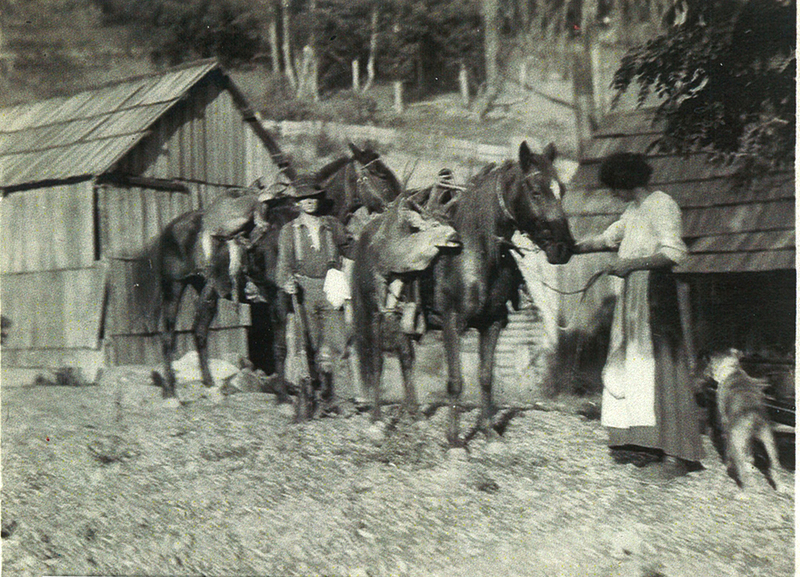 I remember distinctly my mother tying a large wooden dry goods box to a sled that my brothers Ray and Ira had hitched to a gentle mule and horse, and with my younger brother Donald and the twins, Russell and Blanche—who were then around one year old—placed in the box with our lunch and a bundle of diapers; and we were off for the day, the boys to cut and stack willow wood up the north fork and I to care for Donald and the twins while Mother, Levina, and Dora—the eldest—baked and cleaned house at home. We learned responsibility young in those days for the families were large and there was much to be done and money was hard to come by. If we had holes in our shoes and patches on our clothes, we knew that many of our school mates had the same problem. Most of the boys went barefoot and the soles of their feet were as tough as leather. Our fathers had what it took to half sole and mend shoes and our mothers taught us early in life to darn stockings and socks and mend our clothes. We were always grateful for what they taught us. It gave us self-reliance for we were an ambitious bunch—when my two older brothers and I weren’t helping with those younger than ourselves or doing chores of some sort, we were making stilts, bows and arrows, sling shots, toy wagons, sleds and boats. Having no sisters close to my age, I became a real tomboy—I even learned to whistle fluently—which my mother didn’t approve of and she told me that “whistling girls and crowing hens always come to some bad ends” which in plain words meant unladylike. It was nothing to see from twenty to forty deer in one place and quail, robins, and blackbirds were so plentiful all you had to do was aim the shotgun at a bunch and you had enough meat for a family meal. Many times Dad found baby wild animals on the range that had lost their mothers, perhaps to a hungry wild animal, which he brought home and we fed, cared for and loved until they were old enough to fend for themselves. Then Dad insisted that their rightful place was with the other animals and we let them go. It didn’t take long to catch thirty trout in those days either. There were times when we would all go with Dad in the spring wagon. Mother would make a large potato salad and sandwiches, put in a fry pan for trout and a bowl for wild strawberries. The boys would fish and the girls pick berries and a tasty lunch was served at one o’clock which was the time when Dad rode back on his saddle horse which he always tied behind the wagon when he had to ride the range and see that all was well with the stock and fences, whether it was near the mouth of the Mattole River or at Davis Creek near the beach farther north. Always our black trained Shepherd stock dog followed him. It was a sad day for us all when the dog was missing for a while and then we saw him laboring hard—blood was staining the water from his hindquarters and floating downstream. He had not only been a stock and watch dog, but our staunch friend and protector. He had been shot with a shotgun so badly that our father had to kill him to stop his misery. We all felt bitter toward a person who could do that to a dog that would hurt no one unless they hurt him or one of us. 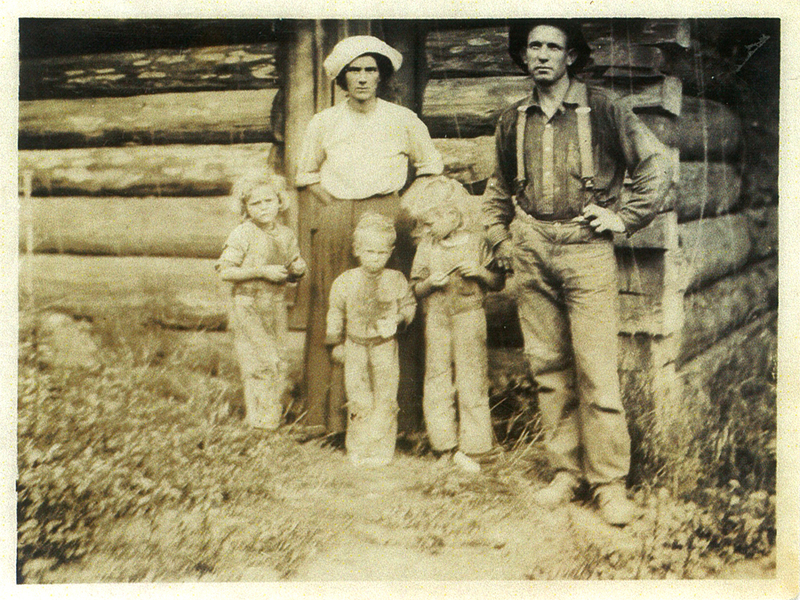 It wasn’t long from that time that we moved from the large stock ranch to a small place across from the church where we lived for a few months until Mother and Dad bought Grandma Ellingwood’s 160-acre parcel called Shenanigan, four miles southeast of Petrolia, for around one thousand dollars. [This is now the John and Glenda Short place—ed.] My youngest brother, Lewis, was born there April 5th, 1906. Five days later we experienced a very hard earthquake. [This must have been the great San Francisco quake, which occurred on April 18, 1906. –ed.] It was early morning and daylight was showing outside. Mother had left the kerosene lamp burning low all night so that she could see to care for the baby. It crashed to the floor breaking the chimney. Dad jumped out of bed and grabbed the lamp fearing it might start a fire. He cut his bare feet on the broken glass in the struggle to keep his footing. After he reached the outside door and threw the lamp outside, he looked up and saw the large fir trees swing and their tops hit the ground first on one side and then the other. The beds with casters rolled over the bare floor with us in them, which tickled us afterward at the thought of it. In the old-fashioned narrow pantry, there were broken dishes, sugar, butter, bread and other things that happened to be on the shelves, all on the floor with milk and cream from six pans spilled over them. The Petrolia school and a few other buildings tipped backwards so we had classes in the church until a new school house was built. The earth shook so hard the dirt from a cliff slid down and made a dam across the river and there were slides the width of the road. There is more to come from Grace. Dan Huddleston gave us the memoirs of Grace Hunter Christensen from which I draw today. His grandmother, Fran Graves, was given them by Grace (although Fran’s mother, Hazel Kelsey Flowers’, name is handwritten on the typed document). Grace Ellen Hunter was born in 1895 in Petrolia to George Walker Hunter and Mae Maud Ellingwood. Her siblings included Levina, Dora (Mrs. Oscar Smith), Ray, Ira, twins Russell and Blanche, Clara, Myrtle, Lewis, and Madge. Her father, George, was the son of Walker S. Hunter, who for a time owned the business center of Petrolia, and Nancy Bellamy. Grace passed away in 1985. Grace's great-grandmother, Eliza Ann Martin Hunter (1804-1894), mother of Walker Sanders Hunter. Before Grandma [Nancy] bought a spinning wheel and small sewing machine on which the wheel was turned by hand, she made the boys pants and jackets of buckskin. When they thought the buckskins had become too dirty and stiff from being wet, they’d ask their mother to make new ones and she’d answer that they’d last for some time yet. So, the boys would take turns lightly sitting on the grind stone while another turned the wheel until a hole appeared—so of course new ones must be made. Later there came the grist and small sawmills. They had wheat and corn ground for their own use and bought lumber for new homes. Nancy Hunter had the first wood stove that was shipped in. Her first cookies were made of very short baking powder biscuit dough, rolled thin and sprinkled with sugar. Each year there was a beef stock round-up. The cattle were driven by trail over the hills to Sacramento where buyers were waiting. The Indians liked the white man’s bread and if a few along the way saw the herd, they would gather white worms from the bark of trees, ask for two slices of bread, place the worms between, and to them it was a delicious sandwich. In 1863, because of the killings and atrocities done by some of the boldest Indian warriors there was a massacre at Squaw Creek. They killed every Indian they could find in the encampment including women and children. The Indians’ cruelest warrior, called Snagle Tooth, was also killed at the time. The Mountaineers gathered and captured many and took them to Round Valley Reservation, but there was quite an encampment left at the mouth of the Mattole. Trust was something unknown between them for some time. One day when my father was walking home with his sisters and brothers, three Indians came riding by—one of them swooped him up and placed him in front of him as he rode. His father and some hired hands saw it as they were riding the range not too far away, they took chase and got him back before the Indians reached their encampment. Most of the Indians living there died when an epidemic of measles hit their tribe. Most of the ones left were taken to a reservation. Those left built cabins, the men worked when it was available, the women dug willow roots, dyed them with solution they made from certain weeds and flowers and sold them to anyone wishing to buy. Grandpa Hunter [Walker Sanders Hunter] was the first to start a dairy in Mattole—he bought wooden kegs from my Grandfather Giles Ellingwood who owned a cooper shop in Port Kenyon to put his butter in for market—the milk he fed to the calves and hogs. One day when he had the kegs of butter packed on horses and was taking them by trail to Ferndale, some Indians suddenly appeared. They took his horses, broke the kegs, and wiped butter all over the trees—he was lucky to get away with his life. Walker S. Hunter, father of George Walker Hunter; Grace's grandfather. In the mid-1890s, Grandma Hunter died of cancer. Grandpa had saved his money and wanted to extend his holdings, so he bought the business part of the small town of Petrolia which consisted of the stable, general store, saloon, and barber shop. Times had been hard and many couldn’t pay their bills. The former owners had lied about their heavy indebtedness which Grandpa found out when he took over the businesses. In those days a new owner was responsible for past indebtedness—this was Grandpa’s downfall. Rather than lose everything he turned two of his large ranches over to his foreman, Mr. Zanoni, who was supposed to return them as soon as business was straightened out and things cooled off. But when the time came, Zanoni would have no part in returning them nor would he with a Mr. Wright who had trusted him with his large ranch the same way. There was nothing they could do about it. They didn’t know the laws until they were confronted with them. Grandpa was downhearted and disgusted about the whole thing—he sold all he had—salvaged enough to return to Missouri where he married a widow with a family and bought a ranch. Times were hard and after a few years his ranch was gone, his wife and family didn’t want to support an old man, so he came back to Mattole. He spent the end of his days in Tehama County with a daughter. Times were hard too for the land owners in Eel River Valley. Incomes were low and taxes extremely high. The only one my mother knew who was able to keep his ranch was Mr. Chapin. One traded his ranch for a team of horses. He could get fair wages for himself and his team. Some Danish men and their families came to Eel River Valley, cleared land of brush and trees, sold the wood and trees to help build their houses and barns. Everything they did themselves with hand tools. Their children went to Port Kenyon school at the same time as my mother. She shuddered at the sight of their eating lard on their bread instead of butter which they couldn’t afford. Ingvard told me after we were married that they cooked onion in the fat and added a touch of salt. Professor Inskip was their teacher. My Grandfather Ellingswood was born in England. He didn’t like his home life so when in his early teens, he stowed away on a ship headed from Maine, which perhaps stopped at New Brunswick Island [?] for it was there he lived until he married Alice Guptil at Portland, Maine. From there they came to California. He was a cooper at Santa Cruz for a few years before they and family settled at Port Kenyon. There wasn’t any road between Petrolia and Ferndale and my dad [born 1866] as a young man almost lost his life and that of his saddle horse in the heavy surf on the beach just south of Centerville on his way to Ferndale. Even after a road was built, they still travelled the beach from the Ocean House, where the Russ home stands, [south] to the foot of Domingo Hill, the old road to Petrolia [now Zanones’ corrals, at the foot of the road up to their and the Scientology places]. One day a Mattole man accidentally cut his leg with an axe. Two men helped the best they knew, and made him a bed in the back of a spring wagon and headed for Ferndale and a doctor. On the way, a hungry cougar smelled the blood and they had a hard time keeping him out of the wagon. Photos here are lifted from ancestry.com. The one of Walker Sanders was put up there by Carl Christensen. More next time, folks! Lately i have been reading many pioneer-era accounts of first glimpses of the Mattole Valley. The Now… and Then newsletter i am working on will feature an article printing many of those descriptions of the people, flora, and fauna from the 1850s, before the oil boom really put us on the map. Here is a shorter story, from a bit later on. The document is courtesy of Dorothy Klemp Price of Eureka, and is told by Linwood Clark, Sr., a first cousin of her great-great grandfather, William “Grampy” Clark, the father of T.K. Clark. William Clark and Linwood Clark were the sons of Charles Clark and James Clark, respectively. Charles and James had another brother, Thomas; together, the three made up the extensive Clark presence in early Petrolia. 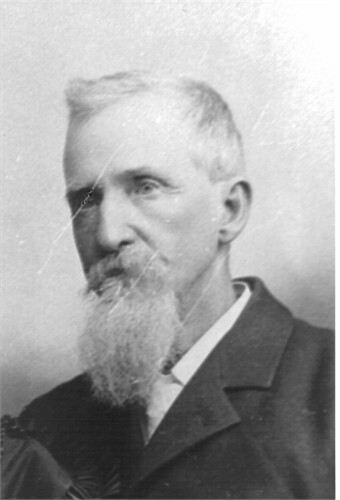 James Clark, Linwood’s father, was born in Yorkshire, England, in 1820. He had emigrated to America in the early 1830s, and had made his way to the gold mines by 1850. During the ’50s he and his brothers were herding cattle between Petrolia, Oregon, and the San Francisco Bay area, with many gold-mining-associated adventures along the way; Linwood’s written accounts vary widely in their dates and story lines. 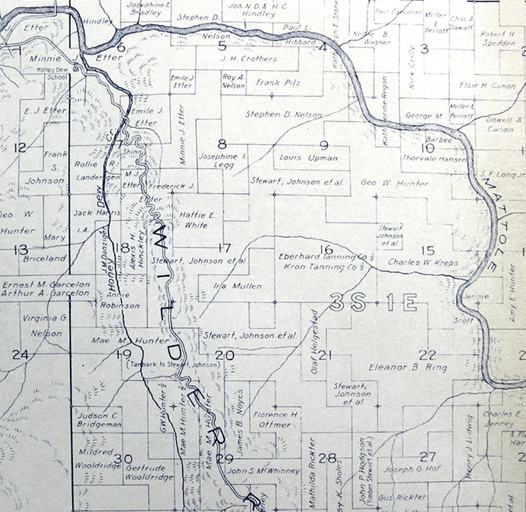 However, what is clear is that by 1867, James had married a woman named Lucinda, or Cinda, Tyler, in Bangor, Maine; brought her back to Humboldt via Panama; and fathered a son– our Linwood Clark, Sr. As Cinda was homesick for the civilized life back East, James returned her to Maine, packing little Linwood on a mule as they crossed the Isthmus of Panama. Cinda died soon thereafter, leaving Linwood to be raised by his grandmother Tyler, as his father James had returned to California (via the first ticket sold in Boston for a through pass to the West Coast by railroad). “For a while the three brothers contracted to carry the mail from Eureka to Petrolia, but this was a losing business, and James gave this up. The roads were bad and no bridges and too often, in winter, [he] had to swim the Eel River on horse-back with the mail tied to the saddle! He would go up to about where Fortuna is now and hit land on the other side five miles lower… this likely had to be repeated at Bear River and again at Mattole to get home. “When I was ten, my father (James Clark) sent for me [in Maine] after he married again. This was in the winter of 1877-78. [He] met me at the mole [a stone or cement breakwater or pier] in Oakland, with my step-mother, and after a few days [we] went to Humboldt on a little steamer not much bigger than a good-sized ocean tug. We were fifty-four hours making the trip to Eureka, later being reported as lost. We went to Ferndale, then in a mud wagon, and that took about six hours, crossing the Eel River on a flat boat strung to a cable, which was an experience! In those days the roads were all hub deep in mud and it took half a day to go to Ferndale from our place, so we only got mail once a week. “I was given a horse; he was a little old, but safe, and about 24 years old, I think. His name was Harry, and he was the horse that had packed Will, Mary, and Sarah from Oregon! However, I learned to ride. Will Clark traded him to an Indian for an Indian pony; a gray roan with big white pinto spots on him. (Notes: The story of the three children of Charles and Martha Clark travelling to the Mattole Valley from Cottage Grove, Oregon, packed in boxes on each side of the saddle, can be found in T.K. 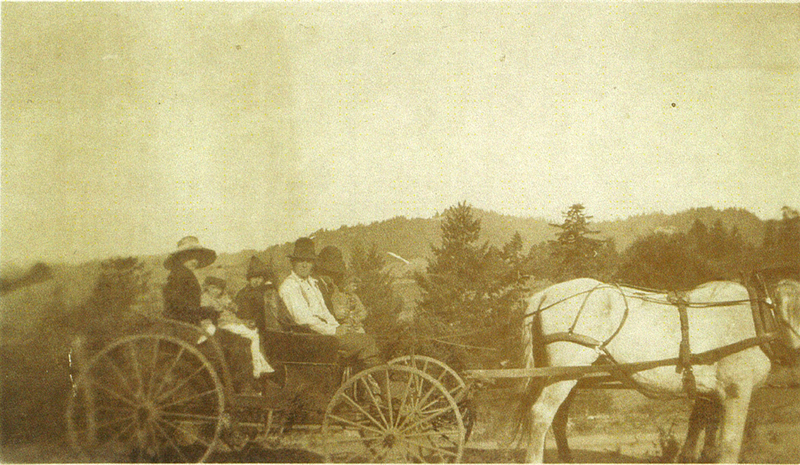 Clark’s Regional History of Petrolia and the Mattole Valley. There is more in these papers from Dorothy Price about Linwood’s hunting skills and his dogs, but that will have to wait for another time.